Although childhood spans less than one quarter of the human life span, it has a dramatic impact on life-long learning and development. Nowhere is this impact more evident than in the field of communication. It is during these formative childhood years that we go from being utterly helpless non-linguistic beings to individuals capable of independently negotiating a wide variety of social challenges. Acquisition of the native language and communicative competencies that support these capabilities are shaped not only by our biology, but also by cultural forces, including those steeped in family traditions, schooling practices, media and the arts. Understanding the interplay between these forces offers unique insight into the developmental origins of communication as well as the ways in which children contribute to shaping the cultures in which they grow. 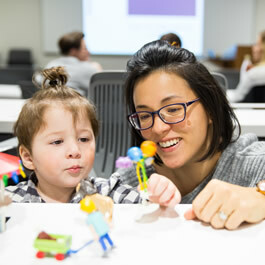 Students will demonstrate an understanding of the nuanced interplay between biology and environment that contribute to building developmental foundations for communication. Students will demonstrate in-depth understanding of how the unique cognitive, linguistic, and social competencies of children shape and are shaped by the media, arts, and traditions of the cultures in which they live. Students will exhibit knowledge of typical and atypical communicative development throughout childhood.